Facebook has announced that it has formed a partnership with Uber to bring the ride-hailing company’s service to the Messenger app. At the moment, the feature is being tested with some users, but it will soon be available to those located in US cities with Uber services. The new feature can be found in Messenger by clicking on the car icon or selecting the transportation option in the ‘more’ menu – represented by an ellipsis symbol. It’s also possible to click on an address from within Messenger to bring up a box that says “Request a ride," that will take you to a screen where you can add your pick up location, destination, and car type. Anyone who uses the service can track and pay for their ride all within Messenger, meaning you don’t have to download the Uber app. You will need a Uber account, though, which you can create within Messenger. As an incentive to use the service, everyone who uses the new Messenger transportation feature will get a free ride from Uber with a value of $20 or less. This perk will only be valid during the limited promotional period. Uber is also planning to use Messenger as real-time customer support service. “We will start testing live support through Messenger to find out if this is the best way to start using real-time support through this,” Uber’s head of API and strategic partnerships Rahul Bijor said. 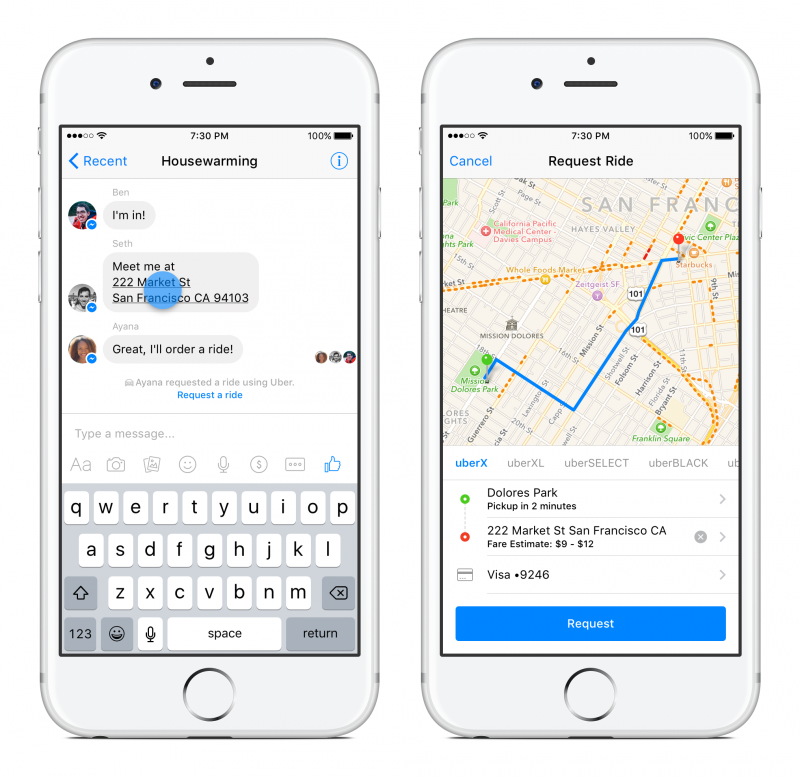 Messenger transportation only works with Uber right now, but Facebook said more services are on the way. The social network is reportedly in talks to make the feature work with ride-sharing service Lyft starting in January, according to a person familiar with the matter. There’s no official date for when the feature will roll out to everyone, but an Uber spokesperson told TechCrunch it will most likely be available to US Messenger users by Christmas.